About two years ago, Mark Miller – a Chez Panisse alumnus and Berkeley transplant – sold his celebrated Coyote Cafe to fellow Santa Fe chef/restaurateur Eric DiStefano of Geronimo. 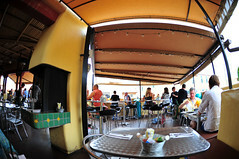 While the Coyote Cafe is a more formal restaurant, the Cantina – its sister operation on the rooftop terrace adjacent to the the cafe – is much more casual, as suggested by its name. The entire terrace is covered with tarp canopies, ensuring that the occasional showers that pass through won’t interrupt service. Counter seating skirts the edges, whilst a mix of high-tops and regular tables fills the balance of the space. We dropped into the Cantina for an early pre-opera dinner (not surprisingly, due to the last night of the opera, Coyote Cafe was full). At 5.30, the terrace was pretty empty. But it filled up nicely by the time we scooted out a quarter after 6. Overall, I was quite impressed by the Cantina. Given ridiculously generous portions, the price point was quite friendly. Had we known how much food was involved, we probably would have trimmed our order (party of three). CLICK HERE to see all of the photos from this meal (or click on the course titles for the individual photos). Both of the salads were excellent, illustrating the benefits of fusion cuisine when done well. 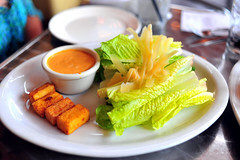 The “Spicy Wedge Salad” quite possibly justified the consumption of iceberg (and who can argue with organic iceberg?). I’ve never been enamored of “The Wedge.” But this was a fantastic version, made especially so by (a) very ripe tomatoes, (b) a spicy blue cheese vinaigrette, and (c) the green chile wasn’t roasted; it was beer batter-fried. 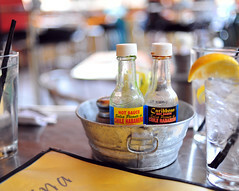 The dressing on the “Red Chimayo Chile Caesar” was a creamy blend of Chimayo chile and anchovy. Someone with anchovy issues would hate this dish. The polenta croutons were the highlight. Still warm, with a slight crusty exterior and a creamy interior, they imparted a wonderful toasty flavor to the salad. I wished there were more croutons, as they would have made up for the dry and hard ribbons of Parmesan. The “main courses” here are substantial. Some, like the “Navajo Taco,” appear to be large enough for two (possibly three) people to share. Others, like the “Tacos Al Pastor,” would be considered a decent meal for a big body with a fairly active appetite but, otherwise, slightly beyond the scope of a normal (healthy) diet. 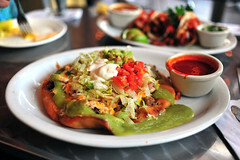 The “Navajo Taco” was essentially a giant fry-bread tostada. The 10-inch round was hot, flaky, and puffy with air pockets. The three types of meat, cheese, shredded lettuce, and sauces were layered on top. Very good. But you wonder how many pounds you might gain with every bite. (Did I mention that it’s topped with guacamole and sour cream and what appeared to be tomatillo sauce thickened with avocado?) The accompanying red chile sauce was hot to trot and wonderful. The “Tacos Al Pastor” presented a fantastic polish on a traditional favorite. At first bite, I had forgotten that there was pineapple with the pork. At first, I thought they were pieces of fat. Thankfully, they were not. The pineapple flavor was quite subtle, contributing to an overriding sweet and spicy flavor of the tender pieces of pork. It was one of the most delicious and agreeable marriages of pork and pineapple I’ve ever had. Our server forgot to put in our order for the “Guava BBQ Duck Quesadillas,” which was supposed to come out with the salads. When we asked him about it half-way through our main dishes, he apologized for the mishap and insisted on sending this out on the house. Amazingly, he brought it out not a couple of minutes later. This was the only disappointment of the evening. The breast meat was sliced very thinly and sparsely applied – the duck meat got lost amidst all of the cheese and “Mexican crema,” a creamy, mayonnaise-like spread sandwiched between the tortillas. I think putting shredded, dark duck meat might have been better. The guava bbq sauce for dipping was excellent, however: a tad sweet, tangy, and smoky. The flavors weren’t bad. I just wish they had gone all-out and made this a DUCK quesadilla instead of a quesadilla that just happened to have some scraps of duck in it. 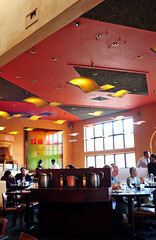 Both our server and the kitchen were extremely efficient. We found ourselves done and paid for within an hour, leaving us plenty of time to charm our way into a table at Coyote Cafe (the restaurant) for desserts (the three options at the Cantina seemed utterly banal). Judging by the meal I had at Geronimo (also a DiStefano kitchen) a couple of days before I visited Coyote Cafe, and the recipes in Mark Miller’s “Coyote Cafe” cookbook I have at home, I can safely assume that the food at Coyote Cafe is now quite different from what Miller was cooking and serving when he owned and operated the restaurant. DiStefano’s menu seems to have loosened from its mooring in New Mexican/Southwestern cuisine, drifting more towards the Asian and contemporary American cuisines. 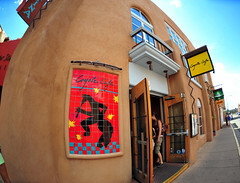 Although the door and entrance to Coyote Cafe is located on street level, the restaurant sits on the second floor of the building. I can’t say I’m wild about the interior – it’s clearly outdated. But I did like the rather generous counter bar seating, which wrapped around a good length of the open kitchen. I also appreciated the huge wall of windows that ran along the northern wall, which affords diners seated in that section a nice vantage of the neighborhood. We each ordered a dessert. CLICK HERE to see all of the desserts, or on the course titles for the individual photos. The desserts here were decent for what we required – a satisfying shot of insulin – but not much more. At $11 a pop, they seemed slightly expensive for what they were. 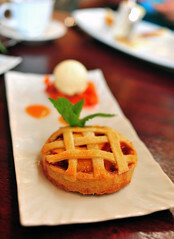 My favorite of the three was the “Organic White Peach Lemongrass Pie,” which had a satisfyingly generous amount of filling – something rare in over-crusted pies these days. The lemongrass element was very light, but definitely appreciable. The nectarine compote and yuzu ice cream was a fantastic coupling. The (leaning) tower of “Roasted Banana Mousse Cake” was similar in texture and concept to the “Mandarin Orange Creamsicle” I had at DiStefano’s other restaurant, Geronimo, two nights before (so, think banana tres leches instead of orange tres leches). The banana mousse in the cake was rather bland. This dish relied more on the roasted bananas for banana flavor. The accompanying mango “souffle” was really just one of those new-fangled “frozen souffles” – essentially, semifreddo in a cup. The most impressive thing about the “Strawberry Chocolate Napoleon” was the chocolate wafer that served as a base for the “Napoleon”: it remained crispy and brittle. The cream cheese ice cream was devilishly rich and excellent. The berries were in top form. And I loved the side “salad” of fruit – basically macerated berries layered on what appeared to be a creamy yogurt base. The coconut in the cream filling, however, was inaudible. Coffee at Coyote Cafe was memorably good. It was served with its caddy of sugars and sweeteners to which was added a cup of cinnamon sticks. Overall, I gained a favorable impression of the Coyote Cafe operation, now no longer under the original owner. The service on both ends was very professional and pleasant. I would certainly return to the Cantina for that Navajo Taco, or to explore other menu options, including a fish taco that sounded great. Apparently, the lunch menu is even more popular among the locals. With time to spare, we got to the opera without having to rush. ~ by ulterior epicure on September 24, 2009.